The Localize This Action Camp focuses on artful activism and engaging progressives in the strategic use of creative tactics. This week, young activists from across the country will converge outside Seattle, on Vashon Island, to attend the Backbone Campaign’s 5th annual Localize This Action Camp. Focusing on artful activism and engaging progressives in the strategic use of creative tactics, the camp will feature a week of workshops, panel discussions and seminars on nonviolent direct action, strategy campaign design, silk screening, community building, how to use projection as protest, eviction protection, youth incarceration, the fight against coal power and fracking, and building power and developing leadership through community organizing. Student debt, a major focus of attendees especially given the recent Federal inability to come to terms with the crisis, is a recurring issue for the Backbone Campaign. Last year, Backbone played an instrumental role in organizing “Occupy Graduation” which attracted media attention from the New York Times, Yahoo News, The Thom Hartmann Show, The Nation, The Blaze, and many others. Graduating seniors at campuses coast to coast attended their graduations prominently wearing the number of their total graduating debt on their caps and gowns. In another creative direct action, Backbone organized a student debt protest in Washington, DC in which protesters wore chains attached to a massive 11 foot-wide ball of student debt. 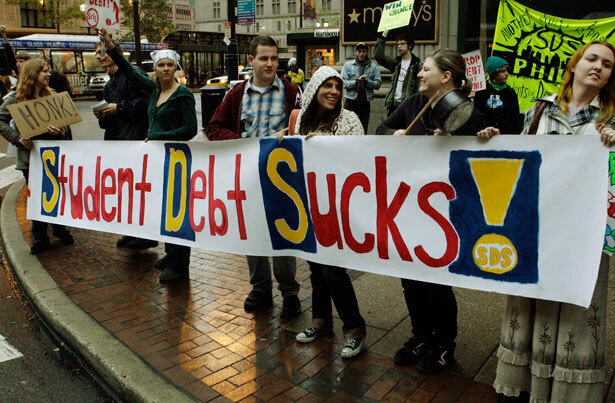 These student debt slaves then delivered the massive $1 trillion ball of student debt to Sallie Mae and to the Department of Education. It's still not too late to attend this year’s Localize This Action Camp. To make a donation to the Localize This Scholarship Fund and find out more about the program and related projects and initiatives, visit LocalizeThis.org.